Perfect for divers, snorkelers and nature lovers! 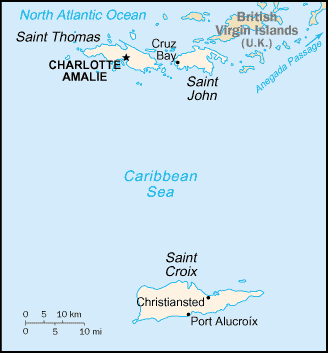 Side One is a mini-map of The U.S. and British Virgin Islands with top dive and snorkel sites located. Side Two is a fish identification guide with nearly 100 species illustrated. This convenient, waterproof reference is made of rigid, laminated plastic. 5.5" x 8.5"
Folded laminated road and travel map, in color. Scale 1:80,000. Legend includes sights, museums, churches, synagogues, archaeological sites, castles, ruins, windmills, towers, caves, beaches, yachting, windsurfing, snorkelling, scuba diving, hospitals, golf courses, parking, petrol stations, international/regional airports, national parks, national monuments, nature reserves, camping sites, viewpoints, hotels, markets, cliffs, reefs. 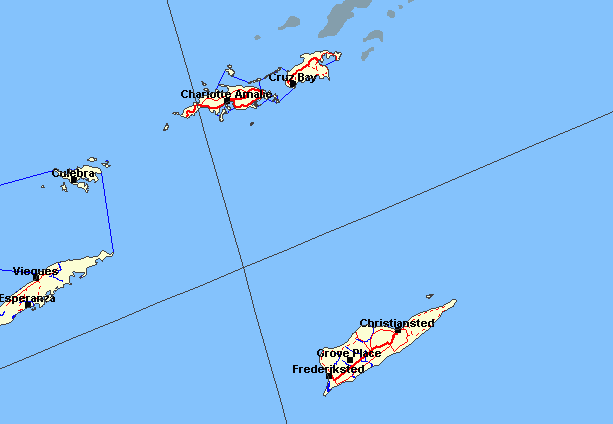 Includes inset map of St. Croix (1:80,000), Charlotte Amalie (1:15,000), Charlotte Amalie Historic District (1:7,500), Cruz bay (1:15,000), Christiansted (1:15,000), Frederiksted (1:15,000), Anegada (1:80,000), Road Town (1:15,000), The Valley (Spanish Town), Lesser Antilles (1:7,000,000). Climate charts show the average daily temperatures, humidity, hours of sunshine and precipitation for each month. Extensive index. Side One is a map of St. John with major dive sites located. Side Two is a reef creatures identification guide with nearly 100 species illustrated and named. This convenient, waterproof reference is made of sturdy, laminated plastic with hole for lanyard. 5.5" x 8.5"
Index to place names, points of interest, public buildings, beaches, islands, hotels, and parks.